During the past three years (2016-2018), there have been 41 reported mass shootings in the United States alone . With 24 hour rolling news, urgent broadcast alerts, and constant access to media at our finger tips, we are able to witness the bytes and bits of the trauma of these events on our screens. As a result researchers believe “we may have reached an historic point in human evolution, where the digital world we have created has begun to outpace our neurons’ processing abilities. The result is that our data-numbed brains increasingly say ‘whatever’ to the world’s troubles. The trauma we witness on our screens — and the indignation that it should spark — goes unprocessed as our minds seek refuge in simpler things” . In fact, researchers at the USC have found that media overload reduces compassion, empathy, moral reasoning and tolerance . With this in mind along with the ever growing rise of the death toll by crazed gunman, Awakened Silence is a response to these incidents. It is a project that memorializes the lives lost and tries to avoid the desensitization and lack of empathy caused by media overload, by reminding us of all the families who could not reach to their loved one’s in the midst of these horrific events. As police, firefighters and paramedics, appear on the scene after a mass shooting, they report the nightmarish sound of “incessant chirping, bleating and incongruously cheerful boom box beats of victims' cell phones” . It leaves responders with an incessant reminder of the friends and family trying to reach the victims. This constant ringing also “short-circuits their psychological defenses”  and disturbingly many responders say it stays with them, explaining they cannot get the sound out their ears. This is a performance composed of hundreds of cell phones awakening after a 24-hour period of silence. The project attempts to use conflict as a creative tool and point out the numbing effects produced by excess saturation to media by putting the audience in place of the first responders. The intent is not only to recreate the experience of the incessant ringing, but also to evocatively create an awareness of technological fixation and subvert its effects. 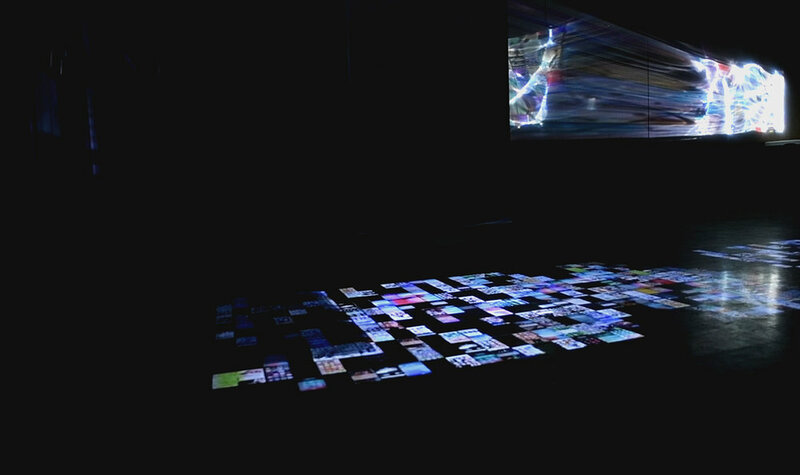 The resulting recorded videos have been compiled into a projected performance of darkness and silence gradually awakened by a crescendo of light and sound. It concludes again with silence, a reminder that at some point the phones stopped ringing, as families and friends, realize what has occurred that the receiver of their messages and calls is no longer there to answer. 1. “List of mass shootings in the United States,” https://en.wikipedia.org/wiki/List_of_mass_shootings_in_the_United_States. Accessed 26 Jan. 2019. 2. N. John, “Warning: Brain Overload,” The Sunday Times, 2 June 2009, www.thetimes.co.uk/article/warning-brain-overload-fv6sc7gmvb8. 4. M. Pearson, “Eerie Sounds of Cell Phones amid Disaster Adds to First-Responder Toll,” CNN, Cable News Network, 29 Jan. 2013, www.cnn.com/2013/01/28/health/cell-phones-death/index.html. Accessed 26 Jan. 2019.